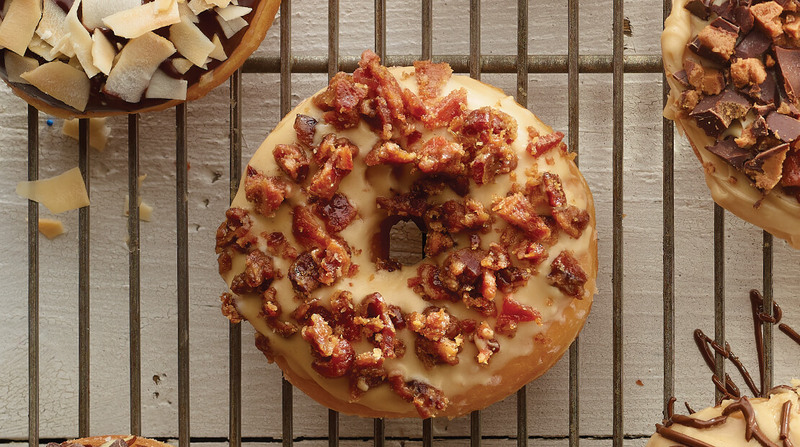 Indulge your sweet tooth with these nutty delicious and smoky bacon topped treats. In small bowl, whisk together peanut butter, whole milk, powdered sugar, vanilla extract and kosher salt until smooth. In shallow plate, stir together brown sugar, cinnamon and ground red pepper. Dredge bacon slices in sugar mixture, pressing to adhere. Place slices on lightly greased wire rack, side by side, over a jellyroll pan. 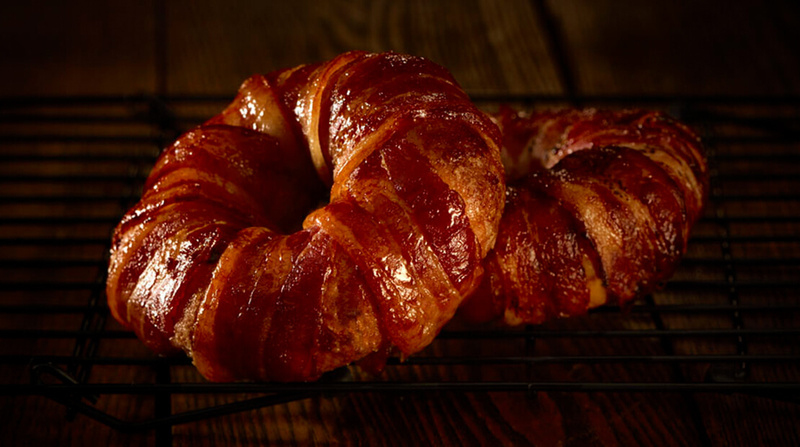 Wrap 3 slices of bacon on each donut. Grill on medium heat until bacon is crisp. In small bowl, stir raspberry jam until smooth. Transfer to a pastry bag, fitted with tip or squeeze bottle with long tip. 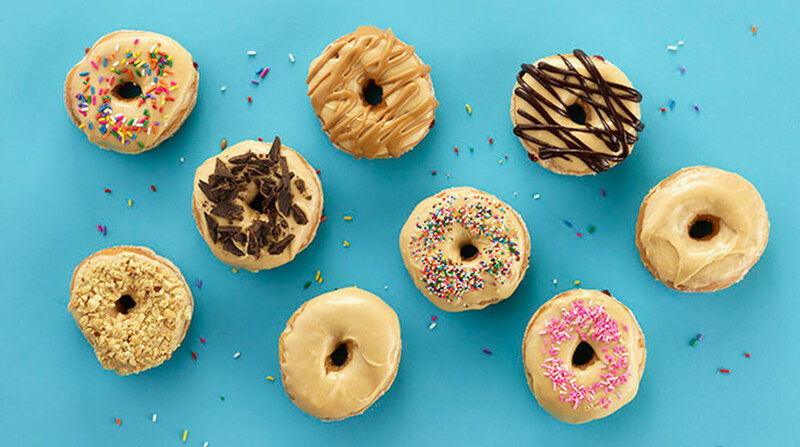 Create holes in both sides of each donut and fill with raspberry jam. In medium bowl, stir together peanut butter, powdered sugar, and milk until smooth. Add additional milk by the tablespoonful to achieve desired consistency. 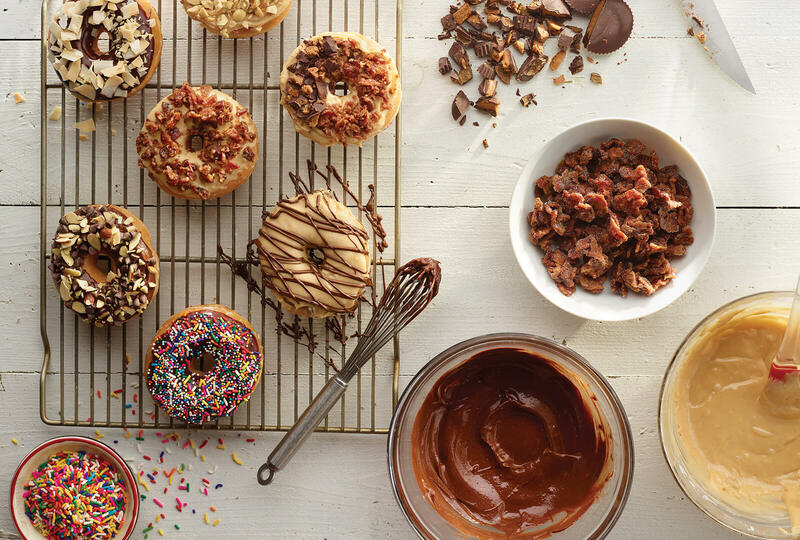 Dip each donut in glaze shaking off excess. Garnish with chopped chocolate, melted chocolate, warm peanut butter, chopped peanuts or candied sprinkles, if desired.